I am currently in what I will call a "trainer transition period." Essentially, I've used up all of my training sessions and I am not entirely sure I want to sign up again. The last few months have been so busy, that making time to get to the gym is hard enough without having to be there at a specific time. Obviously, this doesn't mean I haven't been working out..psha if you even considered that! I've just been doing it on my own time, when I can fit it in. That does make things just slightly difficult because I am either making up my own routines or researching to find ones that are going to really make me cry. First and foremost, is P90X Plyometrics. I have never met a workout that doesn't get easier each time I do it...until this routine. I legitimately rolled my eyes the first time I did this video and Tony Horton "grabbed his knees." I thought (slash told Josh) he is just doing this for our benefit it MUST get easier. I was wrong. There are parts that don't make me gasp as much, but by the end of the DVD I am dead. 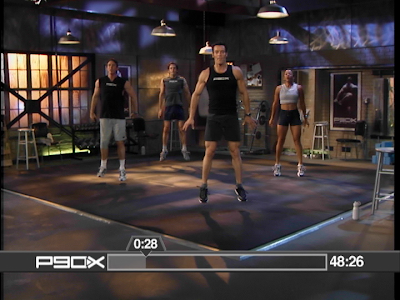 Point Tony Horton. I like workouts that make my heart rate jump and have some sort of weight component. So when I came across this HIT and strength work on FitSugar I had to try it. Again, I am a little insane so I obviously went with the hardest version my first time out and wanted to die. I had to take a nap afterwards. It is supposed to be just about a 60 minute workout. It doesn't take me a full 10 minutes to get through the strength portion though so I usually clock in around 45 minutes. Finally, a combo leg/arm routine that depending on whether you start with arms or legs first determines when you start feeling the pain. For me, it is always the legs so I get arms out of the way first. I usually finish this around 45 minutes on a good day, and if I am feeling extra spunky I throw in some Ab Ripper X. For the arms I use a 8 and 12 lb weights, for legs I use between 30-45lb barbell and then 25lb weights.